Are you ready for a new beginning? God can give each of us a new beginning in Jesus Christ, our redeemer. The book of Ruth is the eighth book in the Bible. In biblical numerology eight is the number for new beginnings. Ruth’s story starts with death and leads to new life. God changed her life and her circumstances and He still changes lives today. In chapter four we see the word “redeem” or “redeemer” 12 times. A gemstone dealer was walking down the aisle at a Gem and Mineral Stone Show in Tucson, Arizona. As he walked along he saw a blue-violet rock about the size and shape of a potato. He picked up the rock and looked at it closely. He then asked the owner of the stone how much he wanted for it. The owner side that he would take $10 for it since it wasn’t much to look at. The dealer bought it and took it back to his lab where he began to examine it and refine it. That ugly blue-violet rock has been certified today as a 1,095 carat natural star sapphire. It is 800 carats larger than any other stone of its kind in the world. At its last appraisal its value was set at $2,280,000. It took someone who loved rocks to really see its inner value. To the other man, it was just another ugly dull rock, not worthy of notice. To Boaz, the land of Naomi wasn’t the real value. The real value was found in who came with the purchase. Ruth was the greatest value of all. Because he kept the faith and didn’t give up, but was willing to pay the price for redemption, he now had a beautiful bride and a place in the lineage of the Messiah. Ruth’s prayers were answered and she became Boaz’s bride. The miracle had finally come to pass and their dreams had come true. What a great love story. But it’s much more than that. It’s a story that foretells the love that Jesus has for his Bride, the church. It’s the story of his great love for you and I while we were living in the poverty of sin. Ruth had come a long way; from the land of death and idolatry, to committing herself to God and His people placing herself under the wings of God, into the heart and home of Boaz. We too were living in death and have been brought close by the blood of Christ. We can be in the family of God and one of these days we are going to be in His home! We left Ruth in Chapter 3, waiting for Boaz to work on her behalf. In chapter 4 we will see the work of Boaz. Christ, like Boaz, will not move in your behalf until you claim Him as your Kinsman-Redeemer. Christ died on the Cross for you; He went through hell for you; and He even today stands at the door of your heart and knocks, but He won’t crash the door. We have to invite Him in. Boaz is ready to act in the capacity of kinsman-redeemer. Ruth is to wait and let him be the one to make all the arrangements. He is the one now who will step out into the open and claim her, actually jeopardizing everything that he has and everything that he is. But he wants her; he loves her. This is the great message of this book: redemption is a romance; because God loves us He redeemed us. The first 12 verses of Ruth Chapter 4 contain the legal proceedings that Boaz had to go through. All the witnesses hear and are agreeable with this determined decision of Boaz. They ask God’s blessing on his house and his new bride. Right after the town hall meeting, Boaz marries Ruth. And blessing comes to the married couple. We read, God opened Ruth’s womb and provided them a son. And then we get the rest of the story, from Ruth comes the lineage of David and Jesus. 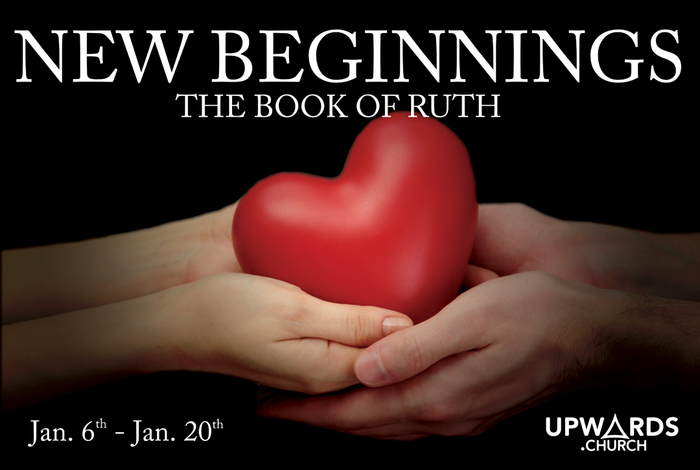 Up until now, Ruth has been a living, breathing illustration of what love and redemption look like, we been treated to a picture of how deeply God cares for people, even wayward people. But then all of a sudden, the writer tells us there’s more to the story than we could have ever imagined. Ruth, who came to Bethlehem from pagan Moab, is the great-grandmother of King David of Israel, the man after God‘s own heart. And, here in the little town of Bethlehem, where King David’s grandpa was born, David would also be born, and much later, the King of Kings and Savior, the Son of David, would also here be born into the world. The mention of David’s line communicates something more. God providentially works even in the middle of a perverse godless generation to preserve a godly family line through whom the Messiah would come. 70 decades before David was born, God powerfully weaves the threads of history together, to the smallest details of human activity, and accomplishes His purpose. He called an unbelieving Gentile woman to Himself in a pagan country. He reversed the bad decisions Elimilech and Naomi made. He worked in spite of a marriage between a Jewish son and a Gentile woman. God drew Ruth to Himself — and she became faithful where her mother-in-law had not been. And her faithfulness, and Boaz faithfulness, laid the foundation for the faithful godly heritage that would become David’s. There’s still one more detail. We should know that Ruth’s name is mentioned in only one other place in God‘s Word — in Matthew chapter 1 — it appears in the genealogy of Jesus Christ. The staggering thing you’ll discover there is, Ruth is one of five women who were part of the line of Christ. And the list is not at all the sort of women we’d expect. There is Tamar, whose husband died, and who subsequently deceived her father-in-law into sleeping with her, by dressing as a prostitute — so she could raise up children. Also in that list is Rahab, from Joshua 1 and 2. She actually was a prostitute, as well as a Gentile — but she was the one who in faith, hid Israel’s spies who came to see the promised land. She converted to Judaism and was the great-great-grandmother of David. The there’s David’s wife Bathsheba — she committed adultery with David, but yet her second son Solomon followed David to the throne and also entered into Christ‘s line. Finally there is Mary, the mother of Jesus. Even though she was a godly teenage woman from a rural town, she spent a lifetime with a charge hanging over her head — that she was pregnant before she was married. The point is this: God has always been in the business of redeeming people and giving new beginnings. Long before our Redeemer came, God redeemed lives — not only in Israel and but outside it as well. People assumed to be without hope and without merit, God redeemed, again and again. He does the same today. Like Ruth, We couldn’t help ourselves. We couldn’t pay the price for redemption, so Jesus paid it for us. He is our Lord and our Savior, and He is the Bridegroom who will soon come to take his Bride away. Jesus knew the value of your soul and mine. Like Boaz Jesus redeemed the earth and bought back his creation that was under Satan’s claim because of the sin of Adam. Jesus came to redeem all of creation from the hand of the devil and the power of sin. Jesus redeemed all of creation and he is going to soon take possession of it all once again forever, but his crowning achievement was the redemption of man who was created in God’s own image. Like Ruth, you and I are part of that redemption. The price of redemption purchased our salvation too, and that’s what Jesus was really after all along. Every other part of the redemption was secondary to the redemption of your soul because Jesus loved each of us, so much, that he was willing to pay the price on the cross just to buy our freedom and bring us home with him to Heaven forever. That’s what we are worth to God. The world may call us hopeless, good for nothing, poor and unimportant, but Jesus loves us and He calls us a Child of God, his brother or sister, and his beautiful Bride. We are more valuable to him than all of creation, and all of Heaven. His great love for us is beyond understanding. In God’s eyes we are the most precious, valuable, priceless creature in the universe. Will you let Christ be your redeemer and give you a new beginning? Bible Exposition Commentary (BE Series) – Old Testament – The Bible Exposition Commentary – History. Thru The Bible with J. Vernon McGee. This entry was posted in New Beginnings - Ruth and tagged Boaz, faith in Christ, forgiveness, Jesus, marriage, redemption, Ruth, Ruth 4, salvation. Bookmark the permalink.